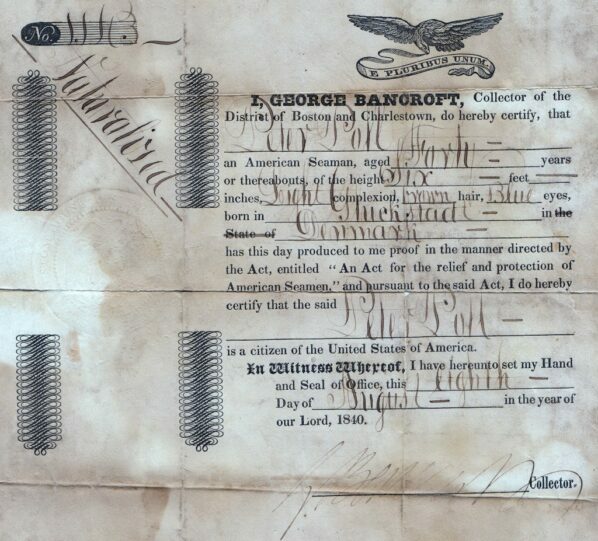 A friend and fellow collector told me once “Documents with the name BANCROFT on it, are usually related to great US history.” I guess he was right. It was issued by a collector of the District of Boston and Charlestown to a seaman of Danish origin with the name Peter Poll. 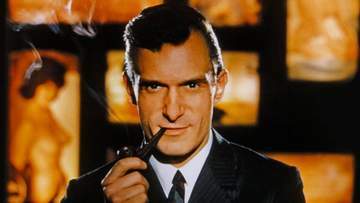 Peter was forty years old and six feet tall. He had brown hair and blue eyes. The seaman’s hometown was Glueckstadt, which was back then Danish soil. Glueckstadt remained a possession of the Danish Crown until its defeat in the Second Schleswig War of 1864. It was occupied by Austria but finally incorporated into the Prussian Province of Schleswig-Holstein in the aftermath of the 1866 Austro-Prussian War. Glueckstadt is today a district of Schleswig-Holstein, Germany. It is located on the right bank of the Lower Elbe at the confluence of the small Rhin river, about 45 km (28 mi) northwest of Altona. Glückstadt is part of the Hamburg Metropolitan Region (Metropolregion Hamburg). 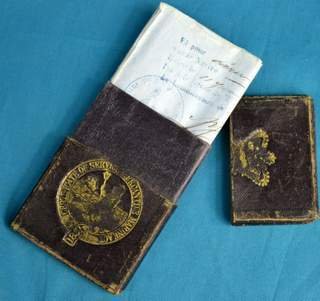 Now guess who this collector was, who issued and signed the seaman protection letter? The man was GEORGE BANCROFT. But Bancroft was also a notable statesman who was prominent in promoting secondary education both in his home state, at the national and international level. During his tenure as U.S. Secretary of the Navy, he established the United States Naval Academy at Annapolis in 1845. He was United States Minister in the United Kingdom (1846-1849) and Minister in Germany (1867-1874). His family had been in Massachusetts Bay since 1632, and his father, Aaron Bancroft, was distinguished as a revolutionary soldier, a leading Unitarian clergyman, and author of a popular life of George Washington. Bancroft was born in Worcester and began his education at Phillips Exeter Academy; he entered Harvard College at thirteen years of age. At age 17, he graduated from Harvard, class of 1817, and went to study in Germany. Abroad, he studied at the universities of Heidelberg, Göttingen, and Berlin. At Göttingen he studied Plato with Arnold Heeren; history with Heeren and Gottlieb Jakob Planck; Arabic, Hebrew, New Testament Greek and scripture interpretation with Albert Eichhorn; natural science with Johann Friedrich Blumenbach; German literature with Georg Friedrich Benecke; French and Italian literature with Artaud and Bunsen; and classics with Georg Ludolf Dissen. In 1820, he received his doctorate from the University of Göttingen. 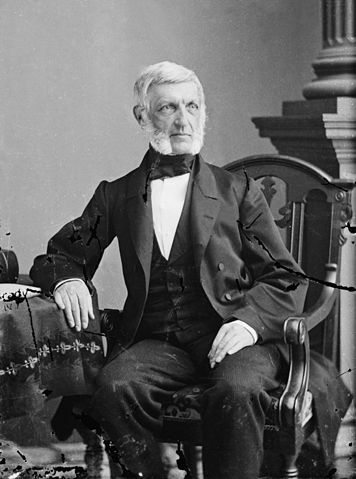 Bancroft entered politics in 1837 when appointed by Martin Van Buren as Collector of Customs of the Port of Boston. Two of his own appointees in the office were Orestes Brownson and author Nathaniel Hawthorne. In 1844, Bancroft was the Democratic candidate for governor of Massachusetts, but he was defeated. He called for the annexation of Texas as extending “the area of freedom” and, though a Democrat, opposed slavery. In 1845, in recognition for his support at the previous Democratic convention, Bancroft was appointed to James Polk‘s cabinet as Secretary of the Navy, serving until 1846, when, for a month, he was acting Secretary of War. During his short period in the cabinet, Bancroft established the United States Naval Academy at Annapolis, creating a legacy of education and leadership. Bancroft designed and developed the Naval Academy; he received all the appropriations for which he asked. Bancroft studied so intensely the Oregon boundary dispute that in 1846, he was sent as minister plenipotentiary to London to work with the British government on the issue. There, he roomed with the historian Macaulay and the poet Hallam. With the election of Whig Zachary Taylor as president, Bancroft’s political appointment ended. On his return to the United States in 1849, he withdrew from public life. He resided in New York and wrote history. There, Bancroft acted as a founding member of the American Geographical Society and served as the society’s first president for nearly three years (February 21, 1852 – December 7, 1854). In 1867, President Andrew Johnson offered Bancroft the post of US minister to Prussia, enabling him to return to Germany (and North German Confederation). Bancroft remained in Berlin for seven years, and President Ulysses S. Grant appointed him Minister to the German Empire in 1871. During his tenure in Berlin, Bancroft spent much time negotiating agreements with Prussia and the other north German states relating to naturalization and citizenship issues; they became known as the Bancroft Treaties in his honor. 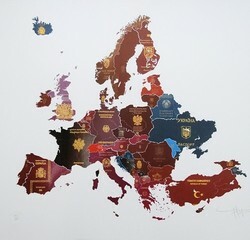 The treaties were the first international recognition of the right of expatriation. The principle has since incorporated in the law of nations. Well, what was “just” a Seaman protection certificate turned out to be a document issued and signed from a most notable US historian and statesman in the very beginning of his career. Such collectibles we love the most.